IF you did, do you feel it was worth the cost??? I'm only familiar with the Certificate of Origin that comes with a new bike before it is registered. What's the reason for a CoO for a 45 year old bike? Other than curiosity value I cannot see any reason to have a CoO. Please bring me up to speed. Growing old ain't for sissies. ps: I learned from the CERT that my bike was imported from Italy to a long gone Moto Guzzi shop which was located in Lillington, NC. And Lillington NC is about a thirty minute ride away from my home here outside of Raleigh, NC now. I think that this is a nice piece of the bikes history to know. The shop in Lillington was Moto America which was the national importer in the 1990s and they also had a retail shop there....I remember attending open houses and seeing 4 1000s models on the floor for sale....they moved to Angier after Lillington. If it ain't broke, I'll break it. I didn't know you could get these. How do you get them, and how much do they cost? 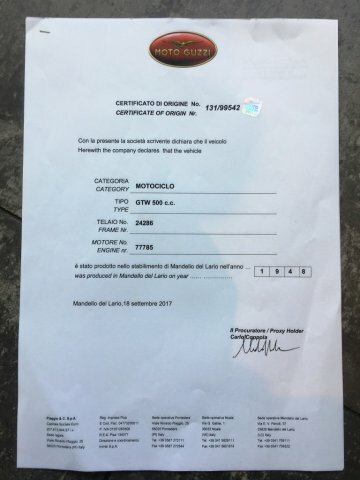 I purchased a Certificate of Origin directly from Moto Guzzi using email and a Bank Transfer. It showed all the details of my 1984 Cali II history. As a retired army guy, a fellow service member brought it to Canada on an Air Force Herc ... but in Italy they had no VIN # plate on the frame. They just stamp the numbers on the frame. My insurance company required this Certificate. Once again, the CO just shows that the bike was made by Guzzi and imported into the US by the importer. I usually do my own DMV work (being Guzzi frugal I can save the $$$ charged as a 'document fee') so I take the CO to DMV along with a bill of sale and thus have proof that the vehicle is legally mine. Then DMV gives me a title and registration in exchange for the CO and my payment of the various fees that the state charges. Oh, and I pay the sales tax too. If you have a particularly significant machine where a paper trail is useful I guess the CO is the 'birth certificate'. For most normal bikes I cannot see any reason to want to pay for a CO.
As an aside, in Italy the owner of a car or motorcycle is obligated to have proof that all taxes have been paid. While stationed in Italy I bought a '73 Laverda and it came with a stack of paperwork showing the tax payment each year from new until when I bought the bike, around 1991. 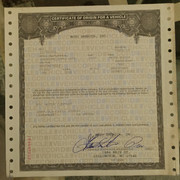 These documents included the mileage each year and a trail of ownership. I later sold the bike and it was imported into the US by an Air Force officer. In about 2001 I met the then current owner of that motorcycle and he was delighted to tell me that he still had that paper trail, to include my former ownership. Thus, I can appreciate the nostalgia surrounding the documentation of this particular bike but I'm convinced the paper trail had little or no added value to the machine. and it's €200 or €160 for members. I would compare it to having a "Build Sheet" for a classic car. Honestly I have a true connection to my bikes. They have taken me many places, and also AWAY from many places. Having 235,000 between the 2 I have now, there is a big connection with them and it would be both cool and interesting to know their Dates of Birth. It's obviously not for everyone. I have NO INTENTIONS to sell either!!! Wonder what Piaggio would do with mismatched frame and engine numbers? I'd certainly like a certificate of origin for the GTV - the title said it's a non-existent 1933 model 157. But not at 160 euro! It is just another gimmick to remove cash from your wallet, if you like it pay. It is also a way to get money from : "YOU ARE THE PROBLEM" guys. They have no new bikes in a BB format, where you have a big 1 piece block. There is a photo of the "certificate of origin" on line and it is a disappointment. The only info is the year the bike was built. No info for date of completion, color, biposto, or delivered to. Perhaps paying for the more expensive version will get you complete info. The Ariel factory record for my '47 shows the engine, frame and gearbox numbers, that it was completed July, 14 1947. engine had high compression piston and polished internals, red and chrome finish, and twin exhaust. And that it was delivered for export to JBNicholson in Saskatoon, Saskatchewan. A similar level of detail must be in the factory records for Guzzis because some descriptions are incredibly detailed. "Moto Guzzi Factory Certificate of Origin shows this GTS was delivered new on 27 March 1941 to the “Milizia Della Strada Di Roma.” It was a special build for the police in Rome. It is also the last of the GTS series." "This rare pre-war Moto Guzzi comes with a letter from the factory (dated December 1993) stating that it was manufactured in October 1938 as a GTC/L for use by the Italian highway patrol police. This letter goes on to say that it was probably a demonstrator and was first delivered to Moto Guzzi's agent in Milan before being returned to the factory in December '38 and delivered to the firm's agent in Trieste in March 1939. 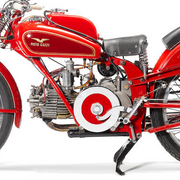 It was finally sold to Moto Guzzi's distributor in Ethiopia in December 1939."